While WordPress is great, your business needs to stand out. You can’t rely on the basic look and feel of a fresh WordPress site. You need an outstanding, attractive and interactive website theme. This is why you need the ”SmallBiz Theme”. This is a truly modern theme that will be ideal for your business. Not only will this theme allow you to effortlessly build the website of your dreams but it’s fully optimized for search engines. It’s entirely customizable and is completely responsive which means it works perfectly on all mobile devices. Don’t waste months waiting; don’t spend thousands on web design. 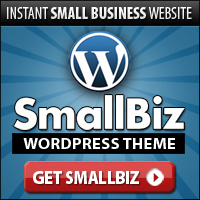 The SmallBiz WordPress Theme is everything you need! If you want to take advantage of the enormous marketing power of local search, check out the SmallBiz Theme today and at least investigate the possibilities of a search optimized website for your business.